With 22 colour photos and 5 colour maps. The year is 1966, and an English yachtsman leaves the River Plate and heads south towards Cape Horn — alone. Ever since his youth Edward Allcard had been fascinated by tales of Tierra del Fuego, with its snow-capped mountains and untouched forests. As the years passed, his childhood dreams of exploring the region evolved to become plans, until eventually he was ready to embark on the journey of a lifetime. His travels would take him all the way down the coast of Patagonia, along the Beagle Channel, and into the Straits of Magellan. Then he would sail north again, through more than a thousand miles of tortuous canals, until he reached the city of Valparaiso. It would be a splendid adventure; a marvellous cruise. 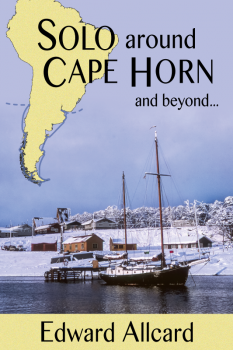 But between the two oceans – the Atlantic and the Pacific – there lies not only Tierra del Fuego but also the Horn, that Cape so dreaded by seafarers of yesteryear. With four single-handed crossings of the Atlantic already under his belt, and with plenty of experience of heavy-weather sailing, Edward Allcard was not a man to be put off by tales of shipwreck and distress. If he were travelling around South America, he reasoned, then he must do the thing properly and enter the Pacific via that famous landmark. One man, one dream, one elderly wooden yacht — and one storm. This is the tale of a wilderness cruise on the desert coast of Argentina and in the snowy Chilean fjords, but between the two halves, at the summit of the adventure, is the story of a sailor fighting for his life. Born in 1914, Edward Allcard was crossing oceans – and writing books about it – before Eric and Susan Hiscock ever set out from the British Isles, and although they are rightly deserving of fame as the first world-girdling cruising couple, Edward Allcard’s exploits certainly surpass theirs both for duration and drama. Seldom could he ever claim, as Eric Hiscock almost invariably did, to have made “another uneventful passage”. Instead, his stories are replete with accounts of gales and other excitements. In 1948, Allcard sailed alone from Gibraltar straight to New York. 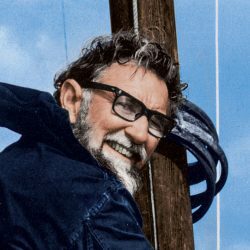 Two years later, on crossing back again, he became the first yachtsman to sail both ways single-handed across the Atlantic. Or at any rate, his passage from New York to the Azores was completed solo; but on setting out from the islands he found that he had a young and beautiful stowaway aboard…! In the Canaries in 1957, Edward Allcard met Peter Tangvald – then a novice, but soon to become well-known in the cruising fraternity. Both anxious to get to the West Indies as quickly as possible, the men challenged each other to a single-handed duel; and thus the first ever east-to-west solo transatlantic race was created. From this first encounter a strong friendship was formed and, many years later, when Tangvald was lost during the wreck of his boat, it was Edward Allcard and his wife who took Tangvald’s teenage son into their home and into their hearts. In the interim, Edward Allcard continued his lone voyage around the world via Cape Horn; and eventually, in 1973 – some 16 years after starting out – he completed the expedition. By now married and with a young child, Allcard subsequently bought an old wooden ketch, which the family restored and then sailed across the Atlantic and throughout the Mediterranean and the Indian Ocean. In 2006, at the age of 92, Edward Allcard finally sold his last boat and moved to the Pyrenees. Now in his 102nd year, he continues to live in this mountain eyrie.